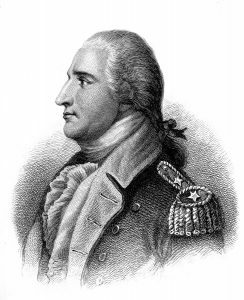 Engraving of Benedict Arnold, by H.B. Hall, after John Trumbull. Skirts swaying, Nel approached the table where British officers sat in their red coats, playing cards for peanuts. She didn’t much like having them here, not when her mother’s kin were across the water, fighting in Washington’s army. But if she hadn’t been willing to serve redcoats and royalists then she would have had to leave New York, and even though the city was half ruin, half smuggler’s den, that wasn’t a price she was willing to pay. One by one, she laid the cups out in front of the men. A young captain, his jacket less frayed than the rest, gave her an appraising glance followed by a sly smile. “Care to join us, sweetheart?” he asked, reaching for her hand. “What’s the matter, you married?” the captain asked with a pout. “Near enough,” an older lieutenant said, nodding to where Samuel sat at the bar, smoking his pipe, watching them with little sign of interest. He was waiting for a visit from a business acquaintance, but Nel knew he’d make time for her later. In the meantime, his smile was enough to warm her on a cold night. The door opened and more soldiers came in, one with powdered hair and gold lacing on his coat. Those at the table bolted to attention. Nausea rose in Nel as she stared at the infamous traitor turned spycatcher. Every local but Samuel got up to leave. His guards clutched their muskets and looked around the room. There was a scraping of chairs as people returned to their seats. Arnold cast a sneering glance across her bottles and barrels, then turned to her guests. “You?” Arnold eyed a man by the door. “You?” He turned on Samuel. “Many fishermen hereabouts are smugglers too,” Arnold said, approaching Samuel. “I can show you my nets,” Samuel replied calmly. She turned away, unable to bear the looks any more. Better to be judged a harlot than to let her beloved Samuel hang, but she prayed that this night would be over soon. Arnold gave a cruel laugh. He tossed a coin to the lieutenant who had fingered Samuel. The gold gleamed as it spun through the air, then clattered down amid the cups and cards. The door slammed shut and Arnold was gone. The lieutenant, unable to look Nel in the eye, walked over to the bar. As he returned to his table, Nel looked down at the bundle of papers beneath the counter. Letters to customers, Samuel had said, like he had on the previous times he’d given her such letters. “They hang spies, don’t they?” she said quietly. She snatched the hand away. “You should find somewhere else for your meetings,” she said, feeling hollowed out inside. “And when it’s not for a meeting?” he asked, raising that smile she found so hard to resist. She filled a tray with cups of beer and headed over to the soldiers’ table. When she returned, Samuel and the letters were gone. She suppressed the sick feeling rising inside her. She couldn’t be worrying about him now. She had a business to run. I’ve been reading Alexander Rose’s book Washington’s Spies, about espionage in New York during the American Revolution. It’s very readable and absolutely fascinating, full of smugglers, raiders, traitors, and all manner of fascinating characters. The only real person in this story is Arnold, history’ most infamous turncoat, but the state of the city and the spy games being played out there reflect reality.